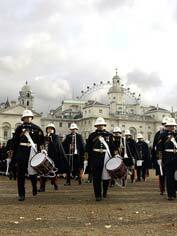 The development of music in the Royal Marines is bound up with the evolution of British military bands. Lively airs and the beat of the drum enabled columns of marching men to keep a regular step. The drum was the normal method of giving signals on the battlefield or in camp. As long ago as the days of Drake and Hawkins the drummer's rhythm would advertise the changing watches or beat the men to quarters. Without doubt, groups of musicians existed in the service before this, but in 1767 Royal Marines Divisional Bands were formed at Chatham, Plymouth, Portsmouth and Deal.